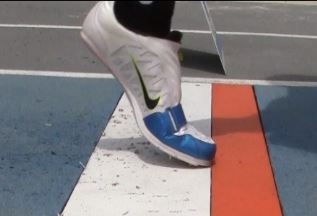 For long and triple jump competitions at all levels. Video review system for take-off board accuracy. Real-time video captured at take-off displays a confirmation image (or video) in under two seconds. Specialized software records and plays-back simultaneously. Choose to record each athlete attempt or record the entire flight as one continuous video. Simple bookmarking at take-off (pressing space bard on the computer keyboard) logs the exact moment of take-off on the video time-line for precise playback and review. Officials, coaches, and athletes can now have complete confidence in each call on the board. The official remains in control, choosing to make the immediate determination or refer to the image as needed. Guaranteed not to delay the event when used as intended. Official can review the video before the athlete rises from the sand to exit the sand pit. The completely portable system can be run entirely off of a laptop computer battery. Import an athlete list (Hy-Tek .evt or excel template) for auto-naming of each athlete attempt when choosing to record separate video clips. No need to be a computer expert, three simple key-strokes by the operator places image of the foot on the board. Easily export full video or still image(s) for proof of performance as needed. Includes: Lenovo laptopo computer, Pro software, high definition USB camera and cable.